"The EU Does **NOT** Recognize Israel's Sovereignty Over Syria's Golan Heights" by Non Mirage Truth Vision (2019-03-26) - Has not changed despite the US position declaration of support. "🔴 LIVE KMN w/ Robert Inlakesh" by Know More News (2019-03-24) - Great Interview ! ! ! 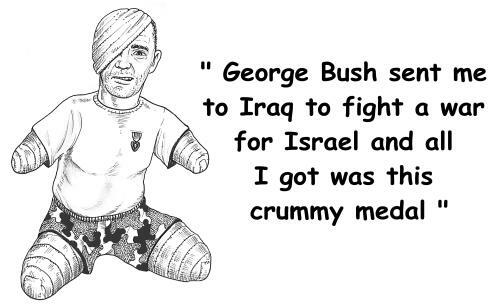 RT: "Netanyahu’s Stranglehold on Trump Explained"
"George Bush sent me to Iraq to fight a war for Israel and all I got was this crummy medal."